Its finally here, the next instalment of our Rainbow collection! 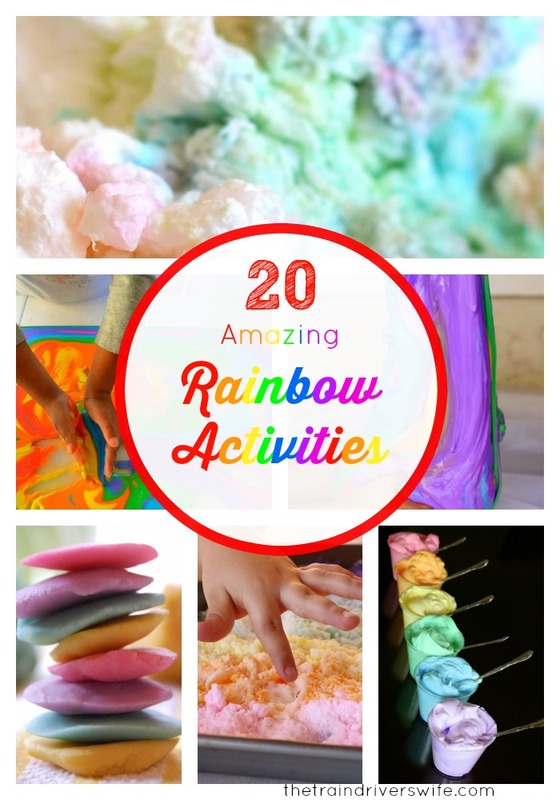 I have been slightly obsessed by Rainbows lately and have been gathering together the best Rainbow Activities and Crafts from across the blogosphere. If you missed the previous instalments, you can check them out here. This week, I bring you 20 Amazing Rainbow Doughs, Slimes and Science Experiments. So, sit back and enjoy. You won’t be disappointed! Tinkerlab’s Rainbow Playdough looks fabulous and super moldable too! Have you tried Cloud Dough yet? This dough is so soft and silky, and this Rainbow Scented Cloud Dough from Lemon Lime Adventures has the added bonus of smelling fabulous too! The only thing that can make Rainbow Dough better is Glitter! Check out this fantastic Rainbow Glitter Salt Dough from The Imagination Tree. Your kids can have tons of fun with this Colour Surprise Playdough. Keep them guessing for hours! This Rainbow Foam Dough from Fun at Home with Kids is simply amazing! I want to delve into it up to my elbows! Happy Hooligans’ Rainbow Playdough is so colourful, kids won’t be able to resist playing with it! Check out this awesome and original way to make colourful Rainbow Playdough with Crayons from Sugar Aunts! I had never heard of this before and I’m super excited to have found it! I love this amazingly stretchy Rainbow Slime from Learn Play Imagine. It just looks amazing! We love playing with oobleck but I never, ever thought to make it Rainbow! Check out this fabulous Rainbow Oobleck from Blog Me Mom! Sand Slime is something we have yet to try but when we do we will be making this one! Rainbow Sand Slime has a very unique texture and this one from Learn Play Imagine looks great! You can make your own fireworks with this beautiful Rainbow Burst Oobleck from Twodaloo. I want these Puffy Rainbow Clouds from Twodaloo in my life right now! Play and learn with this simple but fun Candy Heart Rainbow Science from Fantastic Fun and Learning. These Rainbow Eruptions from Learn Play Imagine are sure to get your kid interested in science! You can have hours of fun with this Rainbow Baking Soda and Vinegar Experiment from Happily Ever Mom. Kids can learn all about density with this fun Rainbow Jar from Playdough to Plato. Learn all about absorption with this simple yet effective Rainbow Flower Absorption Activity from Learning 4 Kids. Make your Rainbow Dance with this great Rainbow Milk Experiment from The Joys of Brush. Wasn’t that worth the wait? I am in love with all of these activities and so many of them are now on our to do list (as soon as Buddy stops eating all of our activities of course!) Why not have an Amazing Rainbow Christmas and get stuck into some fun Science and Dough? I hope you enjoyed these activities as much as I did, leave me a comment and let me know what you think!